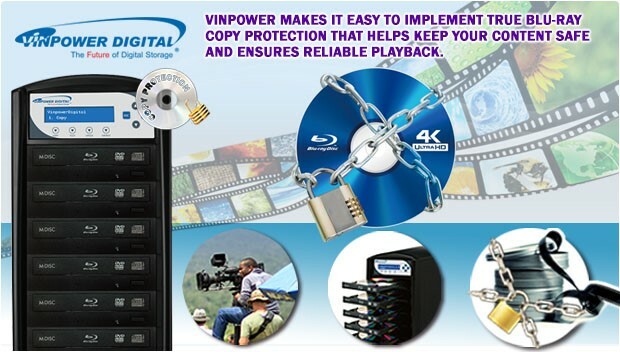 Vinpower makes it easy to implement true Blu-ray Copy Protection that helps keep your content safe and ensures reliable playback. Picture for a moment that you have digital video content that you want to sell or control what you share with others, what are your limitations? One issue could be that those that view your content, decide to make copies or upload online without your permission or consent. If you were hoping to sell that content, then you no longer have the opportunity because someone took that decision from you and made it available for free to anyone. If you had hoped to keep the content private, now it’s been released onto the web or passed from person to person for all to share and see without your ability to moderate who has access based on who legally obtained the content. Protecting content is not just a problem for large enterprise or movie studios, it can affect everyone.